I’ve always loved the taste of lemony flavored desserts. Lemon pound cake? Oh yes. Lemon Cookies? Diggin’ it. Lemon meringue pie? Come to mama. Something about the sweetness combined with the tanginess of the lemon just sends me into a state of zesty dessert bliss. So it’s safe to say that when I had the idea to adapt my Blueberry Peach Crumble Bars recipe to make these Creamy Lemon Crumble Bars, great things happened in the kitchen. I’m always a huge fan of the desserts that could also double as a breakfast food. 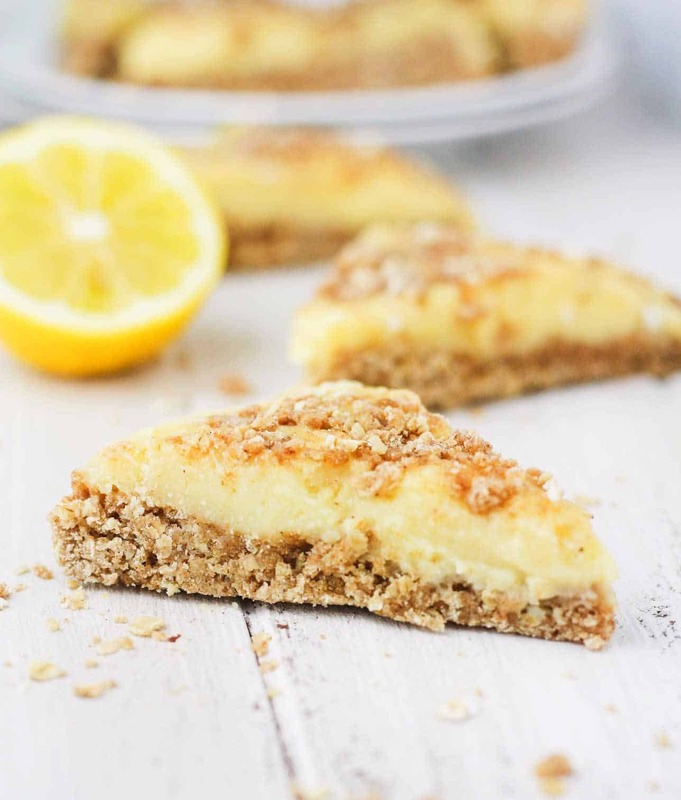 I know…my idea of “dessert for breakfast” can get a little wild sometimes (uh, hi leftover cheesecake) but as for these Lemon Crumble Bars, the fact that they’re not overly sweet makes them the perfect companion for a nice hot cup o’ coffee. Eat ’em cold, eat ’em hot….they’re deliciously creamy either way! Preheat the oven to 400 degrees F. In a large bowl, combine the flour, oats, baking powder and sugar, cinnamon, nutmeg and salt. In a separate bowl. Add the vanilla and vegetable oil spread and whisk together just until the mixture is crumbly. Set 1/3 of the mixture aside - this will be used for the crumble topping. Add the egg whites to the remaining 2/3 of crumble mixture and whisk until the mixture comes together to form a loose dough. It's important to not over mix at this point, or the mixture will become too sticky and hard to work with. Grease an 8x8 pan and line it with parchment paper. Gently press the dough into the pan to spread it out. Bake in the oven for 10-12 minutes or until golden brown. Add the all purpose flour, coconut flour and sugar to a small bowl. Gradually whisk in the eggs, lemon zest and lemon juice until fully incorporated. Pour onto the baked crust and sprinkle with the crumble topping. Return the pan to the oven and bake for an additional 10 minutes, or until the mixture is just slightly firm to the touch. Cool in the refrigerator for about an hour to allow the lemon filling to firm up a little before slicing and serving.